Due to the impending rain storm ET Motopark has decided to reschedule the T & T for Saturday March 6th. It looks that we will get hit with rain around 2pm at the track and I know no one wants to run in the rain. We hope you all can make it on Saturday March 6th. – Jonah Trussel, Owner ET Motopark. Atoka Motorsports Park in Atoka, OK has released their 2010 race schedule. Their season kicks off with a Test and Tune on February 27. The Heartland Nationals will once again be held on Memorial Weekend May 28-30. Read on for the full race schedule and contact information. The National Sand Drag Association (NSDA) announced today that the season opening Spring Nationals slated for March 19-21 has been moved to Dome Valley Raceway in Wellton, AZ. This move was necessitated by persistent rain in the Southern California area making it impossible for track preparations to be made at the new track in Lake Elsinore. Stay tuned for more info regarding this event. 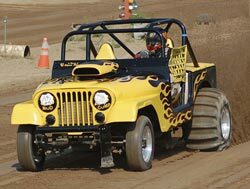 Dome Valley Raceway in Wellton, AZ sent us info on their Test and Tune event upcoming on March 6-7. Click “Read More” to view the event flyer. Fast Track Racing’s Season Opener at the AVI Casino & Resort in Laughlin, NV is complete. Terry Crawford was the big winner in the Top Eliminator class. Terry defeated Bob Snow in the final round on a hole shot 3.36 to 3.33. Pro Bracket class winners were George Amos (Pro 1), Jim Williams (Pro 2), and David Den Hartog (Pro 3). Due to overwhelming racer response and feedback, the National Sand Drag Association is making final adjustments to the 2010 class roster. First off, the Top Eliminator category is moving back to the previous Index of 2.95 seconds. This class will remain a 16-car qualified field as it had in the past. The 2.80 Index Super Eliminator class will be run at each event during the 2010 season with an 8-car qualified field. Another change is that the previously announced brand new Pro Outlaw class will see one minor adjustment. In an effort to allow maximum racer participation in the class, all cars will be allowed to enter this class. The Index range will remain 4.40-Quicker. These changes are final and will stay as such throughout the 2010 race season. We would like to thank all of those who have given us input to make these decisions for the betterment of the NSDA. Lemoore Raceway in Lemoore, CA opened in March of 2009 and is set for their second season of operation. Kyle Evans from the track sent us a note about their upcoming 2010 schedule and class structure. Check out the info he sent over by clicking “Read More”. Dome Valley Raceway in Wellton, Arizona. This is Planet Sand’s warmup race for the Planet Sand Drags event in Louisiana. This track is lazer leveled, and always well groomed. Many records have been broken at this track. This will be 3 days of racing including lots of Test Tune and Qualifying time. The National Sand Drag Association (NSDA) announces a revision to the previously announced Pro Index changes for 2010. Due to racer response and feedback, the decision has been made to discontinue the Pro Index category. In its place will be an Index class for all vehicles that can run 4.4 seconds or quicker called Pro Outlaw. The Indexes for Pro Outlaw will be 4.40 and quicker (example: 4.40, 4.30 on down to 3.10, 3.00). Each racer will dial their own Index to the one-tenth of a second (.1). This will work the same as a dial-in with one Index change per race. All vehicles (non-ATV’s) are legal to enter this class. This will be an all-run class. The National Sand Drag Association (NSDA) has announced a reorganization of the Heads-Up classes that lead the NSDA Professional race program. The Top Fuel (TF) and Top Alcohol (TA) classes will remain the same rules wise for 2010. Top Eliminator (TE) will be adjusted to a 2.80 Index. This will be an 8-car qualified field. Beyond Top Eliminator will be a new category called Super Eliminator (SE) that will feature a 2.99 Index. As with TE, SE will also be an 8-car qualified field. In event of breakage, the number 9 qualifier in each class will replace any car that is unable to run in final eliminations for first round only. The number 9 car will be inserted into the number 8 spot. All cars will move up one spot until the qualifying position of the car unable to run is filled. Welcome to the 2010 sand drag racing season. I hope everyone had a great holiday season. I know it was definitely frigid and snowy here in MI. This is the type of weather that really kicks in the racing withdrawals. The thought that big events are right around the corner is what gets us by. Luckily for the west coast guys, they are able to enjoy the dunes during the off season and are readying for the kick off to their new race season shortly. Let’s take a look at some of the early season events. You never know when you are going to unearth a treasure. While cleaning out some long forgotten about magazines of my dad’s, we came across the January 1978 issue of Super Stock Magazine and realized there was something special inside. This issue of the magazine had coverage of what was the biggest sand drag event of the day, the 1977 “Bakersfield Nationals” in Bakersfield, CA. Kick back and enjoy some amazing sand drag racing coverage from over 30 years ago. The text can be a little hard to read, so I will include a highlights write up at the end. Dome Valley Raceway in Wellton, AZ sent us info on their upcoming Test and Tune on January 16. Read on for all the details. Flyer added 1/7. ET Motopark in Queen Creek, AZ sent us their early 2010 Test and Tune schedule. Open Test and Tune costs $15 per car or bike. For more info, click “Read More” to view their flyer.